Perplexing prevalence: Black parents report fewer concerns about autism features than white parents do. The prevalence of autism continues to increase across the United States, regardless of socioeconomic class, according to a new study1. Overall, black and Hispanic children are less likely than their white peers to have an autism diagnosis. 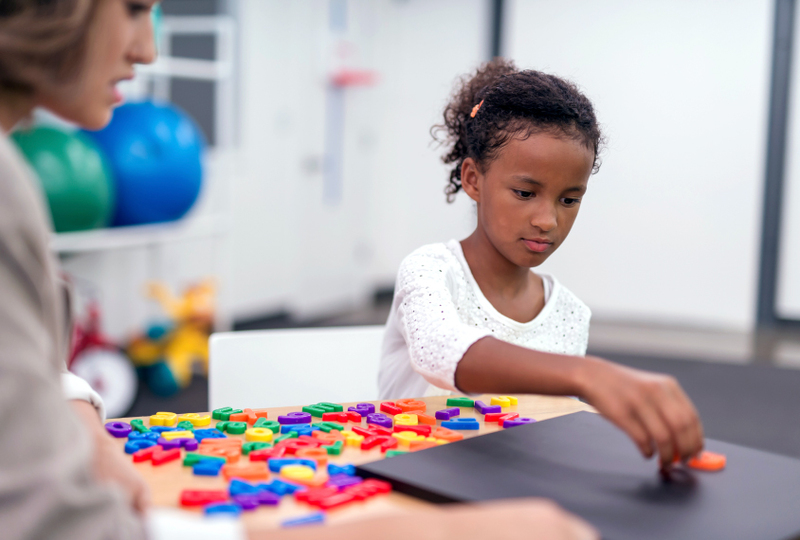 The findings highlight persistent racial disparities in autism prevalence: White children are about 19 percent more likely than black children and 65 percent more likely than Hispanic children to be diagnosed with autism. 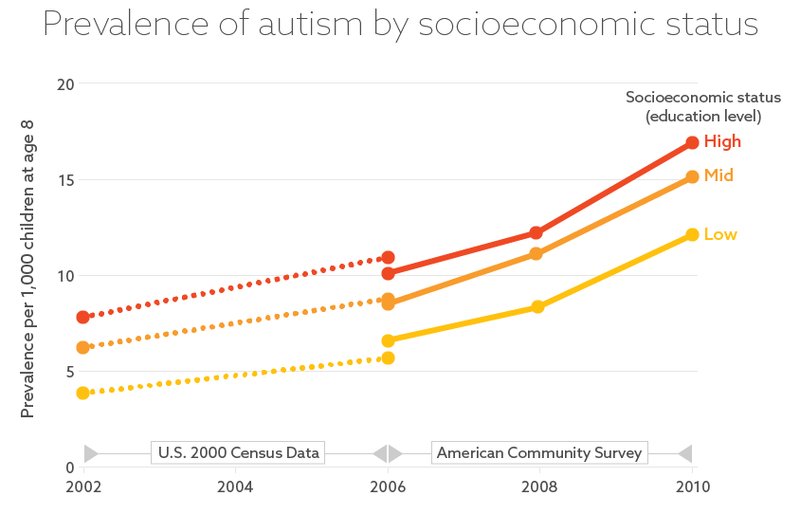 Autism prevalence in the U.S. has more than doubled since 2002. Researchers have looked to changes in the condition’s diagnostic definition and greater awareness among parents as possible explanations for this rise. They have also assumed that access to good schools and medical care would explain much of why white children and those of high socioeconomic status are more likely than black and Hispanic children and those of low socioeconomic status to be diagnosed with autism. The new study upended many of these assumptions. The findings suggest that socioeconomic status doesn’t fully explain the differences in prevalence across race and ethnicity. Durkin and her colleagues analyzed surveillance data from the U.S. Census Bureau and the U.S. Centers for Disease Control and Prevention’s (CDC) Autism and Developmental Disabilities Monitoring Network. The CDC database includes health and education records for more than 1.3 million children at age 8. 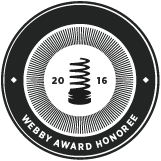 Of those, the clinicians identified 13,396 children who either had an autism diagnosis or would meet the criteria for a diagnosis. The team used census data on the proportion of adults with college degrees in a neighborhood as a proxy for socioeconomic status. They stratified the results by race and ethnicity to determine whether socioeconomic status alters their findings on prevalence. Autism prevalence rose almost evenly among high-, middle- and low-socioeconomic groups between 2002 and 2010, the researchers found. The rates increased from 3.9 to 9.3 per 1,000 children in the low-socioeconomic group, from 6.2 to 11.6 in the middle class and from 7.9 to 13.4 in the high-socioeconomic group. Across the classes, prevalence roughly doubled in the three racial and ethnic groups: It rose from 6.7 per 1,000 children to 13.2 among white children, from 5.9 to 11.1 among black children and from 3.9 to 8 among Hispanic children. This suggests that autism awareness and access to services are increasing across racial and ethnic groups, but the prevalence among minority children still lags behind that of white children. When the researchers looked more closely within each racial and ethnic group, they found that differences in prevalence across socioeconomic classes either stayed the same or became smaller. For instance, the difference in prevalence between low- and high-income white children decreased over the study period. This suggests low-income white families are becoming more aware about autism over time, Durkin says. Among blacks and Hispanics, however, the gap between low- and high-socioeconomic classes remained level. Surprisingly, the rate of autism among black children in the high socioeconomic group was higher than that among white or Hispanic children between 2002 and 2010. “It’s intriguing that in higher-social-class blacks, there’s no shortage of autism,” Durkin says. “Black children are much more likely to be in the low-socioeconomic group than white children,” she says. The finding supports the idea that lack of access to diagnostic services contributes to the overall lower prevalence of autism in black children. There is no biological reason for autism prevalence to differ across racial and ethnic groups, says Katharine Zuckerman, associate professor of general pediatrics at Oregon Health and Science University, who was not involved in the research. “The fact that we continue to see this in all of our prevalence studies in the U.S. suggests to me that we really just don’t know what the true prevalence of this condition is, particularly among minority kids,” she says. Parents in some groups may be less concerned or aware about autism, and may not seek out a diagnosis for their child, says Craig Newschaffer, director of the A.J. Drexel Autism Institute in Philadelphia. Newschaffer was not involved in the study but wrote a commentary about the work in the same issue of the journal2. Another study published this month suggests black parents report fewer concerns about social problems, repetitive behaviors and other autism features than white parents do3. Language barriers may contribute to the lower prevalence among Hispanic children. A study from October showed that a child’s race or ethnicity isn’t related to the time between diagnosis and treatment4. Parental age may also contribute to the disparities. Advanced paternal age is associated with an increase in autism risk, and fathers of white children tend to be older than those of black or Hispanic children. There is a very obvious possible confounding factor in this study which might explain the (claimed) discrepancy in autism rates among socioeconomic classes. The study uses college results as a proxy for socioeconomic status, but college results don’t correlate exactly with socioeconomic status. They correlate much better with intelligence — the people most likely to succeed in college are those who are smartest. And several studies have found that the genetic causes of autism (whatever they are) correlate strongly with intelligence — smart people are more likely to have autistic relatives. In other words, since the study uses a proxy for socioeconomic status, they have a false correlation. Although socioeconomic status correlates with autism, odds are that the cause is not socioeconomic status but the mental ability to succeed in college. This would also explain why the autism rate for Blacks is ABOVE that for whites in the “high socioeconomic status” group. Since society discriminates against Blacks, they find it harder to get into and succeed in college. Those who DO succeed are more likely to have extremely high intelligence — and so have a higher probability of having autistic children. Is this proof? No. But it shows the dangers of using a proxy of socioeconomic status instead of actual data on socioeconomic status. There is every reason to believe the study mistakes correlation with causation. 1. Proxies are PROXIES. They correlate. I do not deny correlation. Correlation is not causation. Cross-correlating is still not causation. And proxies are only proxies. You can find more by googling “autism linked to intelligence.” Note that this still isn’t proof. It is a series of correlations. More data (and fewer proxies!) would be better. But studies linking the two do exist. The authors used “educational attainment” (an ACS variable) – not “college results” – as a proxy for SES. This allowed them to stratify their results by all levels of education. Furthermore, as Hannah suggested, they were also able to replicate their results using “median household income” (another ACS variable that can be used as a proxy for SES), thus increasing the validity of their findings. To my knowledge, there are no studies suggesting that “smart people are more likely to have autistic relatives.” What we do know is that autism seems to occur more often in families of physicists, engineers, and mathematicians compared to other academic disciplines. Finally, the authors never claimed that their findings reveal a causal relationship between autism and SES. Science has little idea yet what the biological causes of the different subgroups of what is currently under the umbrella heading of autism are, or how genetic flaws might affect biology. Though obviously there are now many thousands of studies suggesting many different intriguing hypotheses. In fact science does of course know that there some racial differences in metabolism, most obviously skin colour’s effects on D absorption, but also in other areas. It would be wrong to follow Zuckerman’s line and ignore the clues which biology might be offering here. Different cultures obviously might be having an impact. I can’t comment on US Hispanic cultures, but in England for example I see differences in holiday patterns between different ethnic groups. It might also be worth looking in more detail specifically at the mothers of the autistic children here. If middle class black mothers have more autistic children, is that linked to their having high-powered, long hour jobs and working long hours in pregnancy, which might have further effects, for example, on getting out in the sun, or high stress rates in pregnancy? Or their bloodwork in pregnancy might produce some pointers. But really, until the sub groups in autism are identified the whole picture is going to be extremely confusing.